There are good fast food and there are crappy ones. Fortunately, Burger King resides in my "good list" amongst the ranks of In-N-Out, Hardees, Carls Jr, Popeye's (ex-Singapore), Wendys, Church's Texas Fried Chicken (defunct), A&W (the early years), just to name a few. Nominees in my bad list are McDonald's, A&W (present day), Popeye's (Singapore) and Long John Silver. Surely, pro-Macs (not the computer) would be leaping out in defense at this point and gushed about their fries. Sure, they are pretty good but after you have tried In-N-Out's Fries (Animal Style) i.e. fries lathered with melted cheese and fried onions, the prior is at best, No.2 only. Anyway, today's entry is not about critiquing about who is good and who is not. I am writing to pay tribute to Burger King for a good thing that they have done. 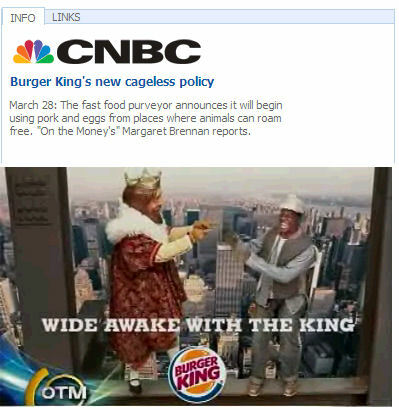 Burger King has recently committed to eggs and pork from farm that do not keep their animals in cages. Slowly this will move on to beef and hopefully be able to inspire other fast food chains to follow suit. While it is required that we slaughter for food, surely there is a humane way to doing so? PETA has lavished Burger King with kudos for this commitment and I cannot help but voice out my approval here as well. One more reason for me to favour Burger King over McDonald's. Click Here for PETA's article. Click Here or above image to view MSNBC video link.